The other day we went to the beach. Annie just wanted to chill and dog watch. But I thought it was important to exercise; after all a healthy diet is not the only way I maintain my bikini worthy body! So I found a ball and decided to workout. 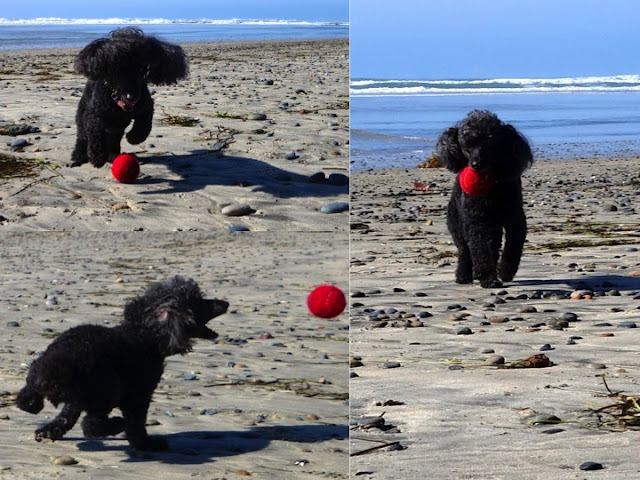 I chased and barked at the ball, pounced on the ball and then retrieved the ball. What a fab workout. Rosy what a great idea! I bet Bear taught you all about exercising with a ball. It sure looks like it's fun as well! Yes! I used to do Ball workouts all the time with Bear!!! He did ocean ball too as you know, which is when I would work on my tan. BearHUGs & RosyPoodleKisses! Yes! So fun and so pretty out! Annie thinks all dogs are watch-worthy, especially those that come near Mommy! BearHUGS & RosyPoodleKisses!